Desk calendars are wonderful and useful gifts to your customers in Vernon. Not only they look nice but they also play an important role in customer retention for your business in Vernon, as they are always in front of your customer eyes. Make sure to have your company logo and contact information on them so that your customers in Vernon can easily reach you when they need your products or services. Increase your results even higher by putting exclusive monthly specials on every page of your calendar, so that your Vernon customer feels special. By printing your desk calendars with Print Factory Vernon you get outstanding customer service, competitive pricing, fast production time and great print quality. Our Vernon customers can order as little as 25 calendars per order. 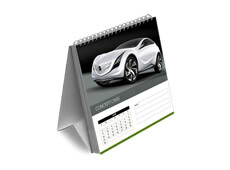 Not sure how to design your Vernon desk calendar or just simply don’t have time – let us do it for you. Our creative and professional design team will do all possible to make sure that your calendars for your Vernon business look great and outstanding. If you have any questions about desk calendars or would like to get an estimate for your company in Vernon, please don’t hesitate contacting us. We are always happy to assist you and answer all your questions via phone, email or in person.